Craneswater A beat Portchester X 6-3 and are nailed on favourites for the top-flight silverware with two weeks of the Portsmouth & District League campaign remaining. Mathematically, only Copnor A can catch them. But realistically, they have little hope of preventing the trophy going to the Southsea club. Mike Talmondt, Andy Boulton and Rob Kirby were all at the top of their game against the Castlemen. Mark Kingswell and Justin Andrews were outstanding for the visitors. Copnor A were better this time out – beating Craneswater R 7-2. Lee Eden, Kev Harding, Ant Lacey and Steve Toms all bagged a brace towards their best result for a month. Ade Binding knocked in a 40 to win both as Craneswater Z edged a 5-4 win over Waterlooville A.
Skipper Ian Carter and Mark Jones backed him up to fend off the efforts of Steve Wilson. Copnor B kept their faint title hopes alive in division two with two wins in two nights. On their regular match night, they beat hosts Pompey Royals 7-2. Phil Ledington called the tune with a 44 break before Paul Harvey, Derek Foster and John Oldfield cruised to similar doubles. Jon Challacombe and Dave Chivers offered token resistance. The next night Copnor B pinched a 5-4 win over top-of-the-table Craneswater Q. Foster and Oldfield potted everything to cut their advantage at the top to four points. The Southsea men had a bad week – also getting beaten at lowly North End Bowls after sitting pretty at 4-2. The pairs session was gobbled up by the home side – with Ian Pledge and Mike Dorey winning again. Waterlooville B were back in the groove with an 8-1 home triumph over bottom-side Alexandra Bowls. Terry Hickley and Shaun Hounsome rubbed out Matt Small’s early strike to lead 2-1. The rest was one-way traffic with Sam Tindall, Steve Hughes and Heath Smith showing their talent. The division three chart is back to normal with Waterlooville C sharing the top spot with Leigh Park. Rob Derry’s crowd were given a helping hand as Al’s Club turned up one short at Aston Road. 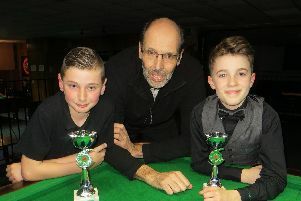 The skip took full advantage – along with son Rob and Phil Watson (33) – winning two racks for an easy 7-2 success. Leigh Park played second fiddle at Craneswater Dandy. Mel Davis and Nick Hutton dominated in a 5-4 victory to dent the visitors’ hopes. Cowplain B also held their nerve to beat Misfits 5-4 in the one-club match. Ray Axton and Dave Weadon did not deserve to be on the losing side with two apiece which was not achieved by any of the other 10 cueists.